In the past, I talked about certain groups who claim that the Church today has fallen into error—usually done to defend themselves when they run afoul of a teaching they dislike. My usual response is that if the Church could be permitted to fall into error, then Matt 16:18 and Matt 28:20 would be promises that Jesus either could not or would not keep. That would mean that He was not God, because God keeps His promises. But Jesus is God and He keeps His promises. Therefore the Church could not have fallen into error. It occurs to me, however, that some might want to defend their own position at the expense of the Church, arguing that this would be the wrong interpretation of these verses and therefore the reliability (and divinity) of Jesus Christ is protected… basically that the promises of protection means something different than what the Church thinks it means. Therefore when the Church speaks against what *I* think right, it must be in error. But that argument won't work. When Jesus speaks of the Church, He speaks of a visible Church which teaches in His name and with His authority. If we have a dispute, we are to go to this Church. If we refuse to listen to this Church, we are to be treated as a tax-collector. That means the Church that speaks with His authority must be visible and we must be able to go to it with confidence—which indicates a Church that can be trusted to make the right decisions with His authority. That reasonably assumes a Church which is protected from error. Another attempt to defend one's position at the expense of the Church might be that the whole Church never goes entirely into error at one time, but no single part of the Church is especially protected all the time. Under such a view, Rome might be the champion of truth at one time, Constantinople at another time and Écône at a third. Therefore Rome could be right in Vatican I, but wrong in Vatican II. But this can't work either. if any part of the Church can go into error, then we can never know for sure when it wasn't in error. If you think it was possible that Rome could have been in error during Vatican II? Then why not in Vatican I? Why not Trent? Why not Nicaea I for that matter? The point is, if part of the Church can fall into error without us being able to know which part can be trusted to be protected from error, each part will simply assume it is protected from error during this dispute and the others are not (I mean, come on… does anybody approach a dispute with an attitude of Well, I'm probably the one in the wrong…?). In such a scenario, the Church is going to wind up in constant division and become countless denominations. Once again, we would have no visible Church to turn to. It is only when we know that, no matter how rotten parts of the Church might become individually, the Church under the headship of the Pope is protected and we can know where the authoritative teaching of the Church—protected from error—can be found. Now, at this point, some Protestants might proclaim that the existence of the Bible means that we don't need to worry about a Church—we just need to follow the "plain sense" of Scripture. But that doesn't refute the Catholic concern here—it is actually an example of why the protection from error in a visible Church is necessary. Right at the beginning of the Protestant Reformation you had the Lutherans, Zwinglians, Anabaptists and Anglicans. All of them proclaimed the Bible as their rule of faith and all of them used the Bible to justify their own positions and condemn the other three as being in error on important issues. Each of these groups also split into multiple factions—each of them thinking themselves right and the others in error. Now I won't get into the arguments of how many denominations there are. "Over 10,000" is a number given by some Catholics, while some Protestants get offended by the use of that number and try to reduce it. The number of denominations is irrelevant. Even if the number of denominations had never gone beyond the four in the Protestant Reformation, that's still three too many—and that's if one of them was actually right to begin with (which is of course disputed). And that's the point. Unless there is a visible Church with the authority given by Christ to determine where the true interpretation of His teachings lie, an inerrant Bible cannot be a guide—not because it is deficient, but because it could only be interpreted by fallible men and women. That is to say, men and women who can read and interpret it wrongly… and we can never know which ones. (Though it seems it never happens to be the person doing the reading and interpreting—apparently the Pope is the only person who is not infallible in this view). An inerrant Bible needs a Church protected from error to interpret it from error, and the Church that can be protected from error must be visible and knowable. Otherwise we could never find it and never be able to know which interpretation was correct. To insist on the point of the need for a Church which is known and protected from error is not some sort of "churciolatry." It is a reasoned understanding of God's promises to Peter and the Apostles… the gates of hell will not prevail against her and Jesus will be with us until the consummation of the world. 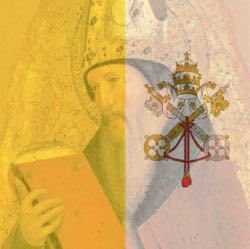 Since the Popes are the successors of Peter and the promises were made to the Church with Peter at its head, it seems that it is entirely reasonable and faithful to Scripture to recognize the authority of the Catholic Church as this Church.